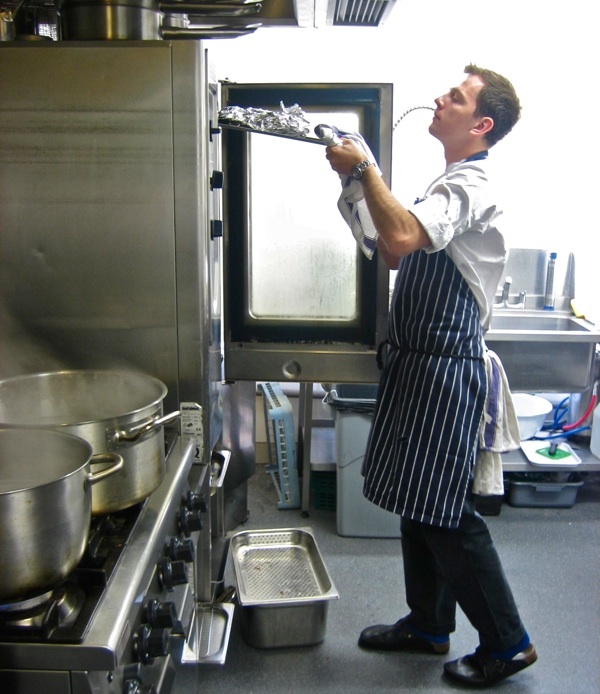 Over a year ago, when I interviewed James Lowe while he was Head Chef at St John Bread & Wine, he confided to me that one day he would like to open a restaurant of his own. 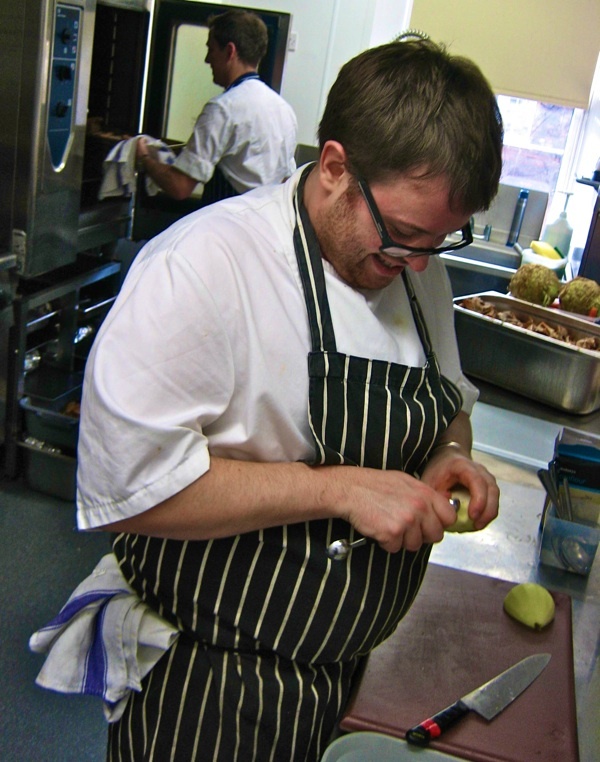 And now James has returned to Spitalfields as part of the culinary collective termed The Young Turks, working in partnership with Isaac Mchale to cook a set menu, changing weekly, at The Ten Bells for the next three months. When I went round for dinner last week, it made me think of another meal long ago in a room above a pub. For when I began my career as a writer, I had a fancy agent who used to know all the smart places to eat and, desirous of feeding me up in the days before I made any income from my writing, he would take me out for lunch regularly. One day, he took me for a meal in the room above the French House in Dean St, cooked by a young chef – just starting out – by the name of Fergus Henderson. Years later, St John, the restaurant that Fergus Henderson created, is firmly established at the centre of the revival in distinctively British cuisine. 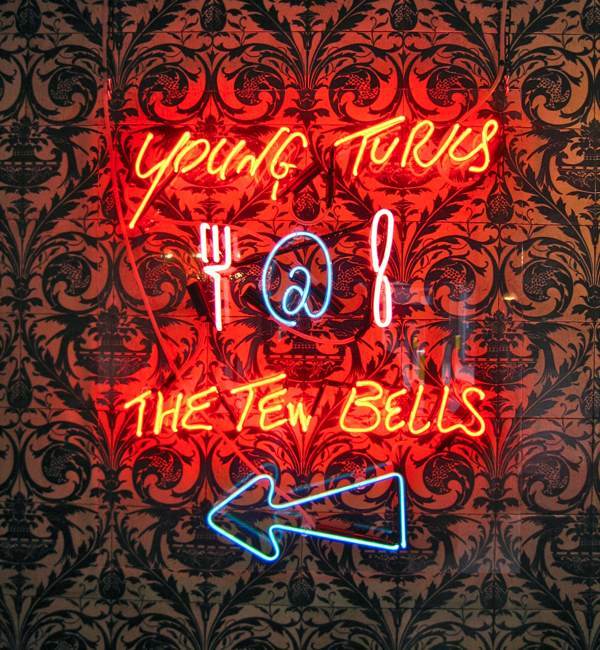 Thus, when I sat down in the room above The Ten Bells on the opening night of The Young Turks, to study the menu set in plain type upon a sheet of white paper, I felt that somehow I had come full circle. In this beautiful high-ceiled space with commanding views towards the market and the church, diners get to enjoy four courses and three snacks plus a cocktail for £39 a head, while eyeballing those on the top deck of the 67 bus going down Commercial St. There is a sense of drama, beginning the moment you step from the street into the clattery din of the bar room lined with gleaming nineteenth century ceramic tiles, before you ascend the narrow staircase to encounter a more civilised atmosphere in the dining room above, lined with pieces of art by Tracey Emin and Peter Blake from the private collection of the owner of The Ten Bells, John Twomey. As one who feels unduly challenged by making selections from menus, I was delighted to be presented instead with a bill of fare outlining the seven plates that awaited me. To start, there were fragrant slices of ham cured by James, then fresh oysters with dulse, followed by a couple of small intensely-flavoured game sausages. By now, the order of dishes and the contrasts they presented were proving a matter of fascination. And it was a intriguing sequence that continued with squid accompanied by watercress and radish, then my favourite dish of the evening – Jerusalem Artichoke with crisps made of its skin – followed by slow-cooked ox cheek, moist and tangy in its own gravy. The meal proved to be a rare culinary experience, alive with subtle flavours and textures, yet thanks to the modest portions I did not feel overly full – just ready for the baked pears which finished off the evening nicely. “A week ago, there wasn’t even a kitchen here,” exclaimed James in disbelief when I dropped by to visit him next morning, wedging myself in the corner next to the sink while he and Isaac set to work on another of their 9am to 1am days, preparing vegetables and checking dishes that were already slow-cooking for tonights’s service.“I met John Twomey for the first time three weeks ago, I came down to The Ten Bells to have a look at the location and liked the room immediately.” James added, just reminding himself how he came to be there surrounded by a pile of ox cheek so early in the morning. Yet in spite of their ambitions, James and Isaac are wisely reticent when it comes to saying anything that might be construed as a “concept” describing their endeavour. 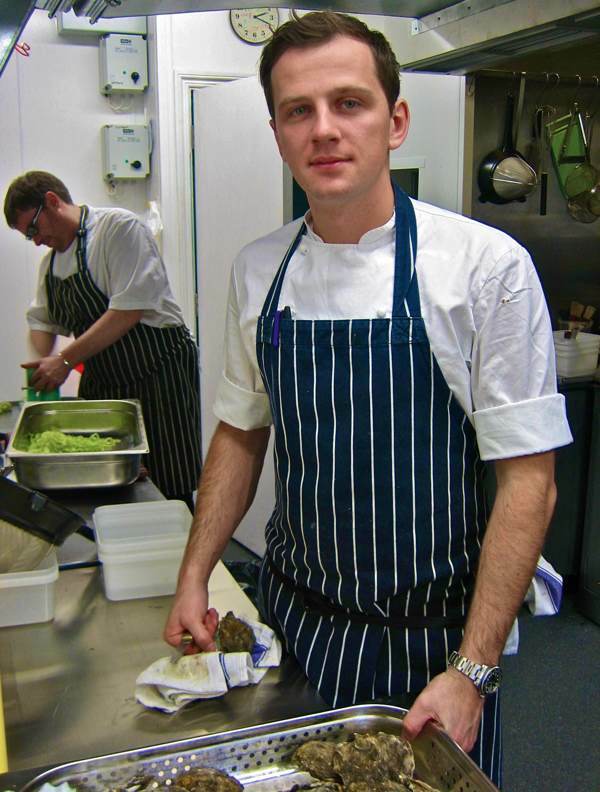 “It’s good British food, we want to be more creative with British produce, we don’t want to reinvent the wheel,” James told me plainly, as he turned his attention from the ox cheek to opening oysters in anticipation of another service of more than two hundred dishes that night. Just to read this makes my mouth water. Good luck to The Young Turks. 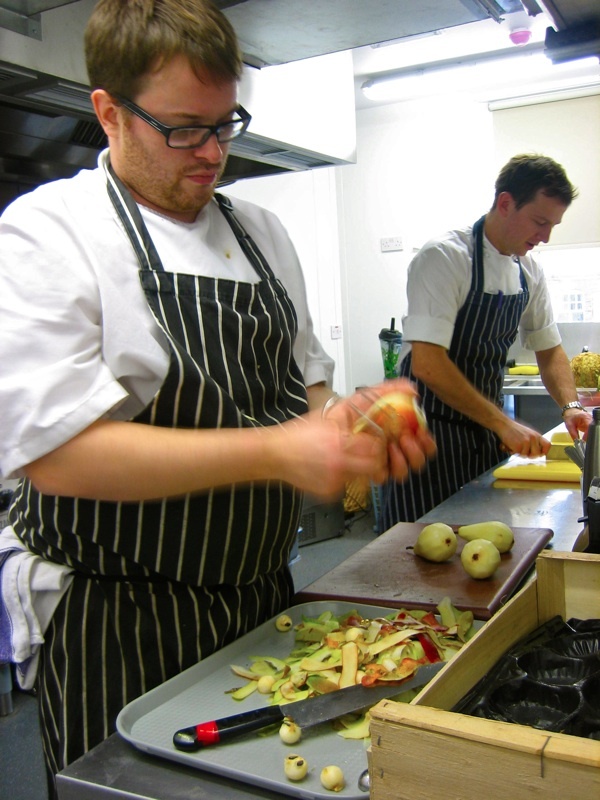 I was extremely fortunate to have experienced Isaac’s and James’ superlative cuisine at the Lexbury this past summer. Each dish was a delightful journey of colourful and tantalizing bites; each course as exciting as the one before…… truly an inspiration of unique food combinations. I wish the Young Turks very much success. They definitely deserve it!